If you're looking for a new home in Scottsdale, AZ you've come to the right place. New construction homes for sale in Scottsdale are built among the most beautiful areas of Arizona within some of the best school districts. Scottsdale new homes are in communities that feature an abundance of amenities such as swimming pools, nearby golf courses, walking trails, playgrounds and parks. Choose from a list of Scottsdale, AZ new home subdivisions, with predefined condo, townhouse or house plans, or pick a Scottsdale home-builder and have a custom home built on your own lot. Whether you choose a new house in a Scottsdale neighborhood or prefer a custom home built by a home-builder in Scottsdale, you can't go wrong using our site to get your new home search started. 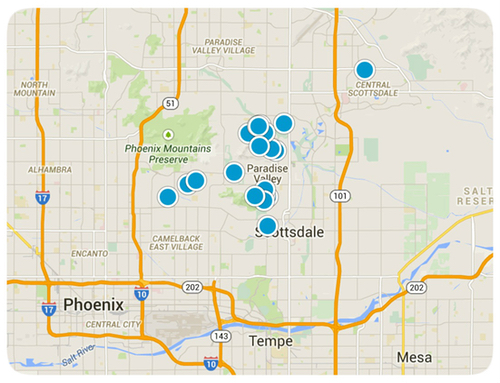 Our easy-to-use search tools will help you with your real estate search for Scottsdale new construction homes.